Bartacks and Singletrack: Birthday suit! I'm going to preface this blog post by saying I do not take on commissions. I don't sew garments for sale and nobody, at least nobody I know, could pay me enough to sew something I didn't want to sew. But give me an idea that I am interested in and I will absolutely run with it! 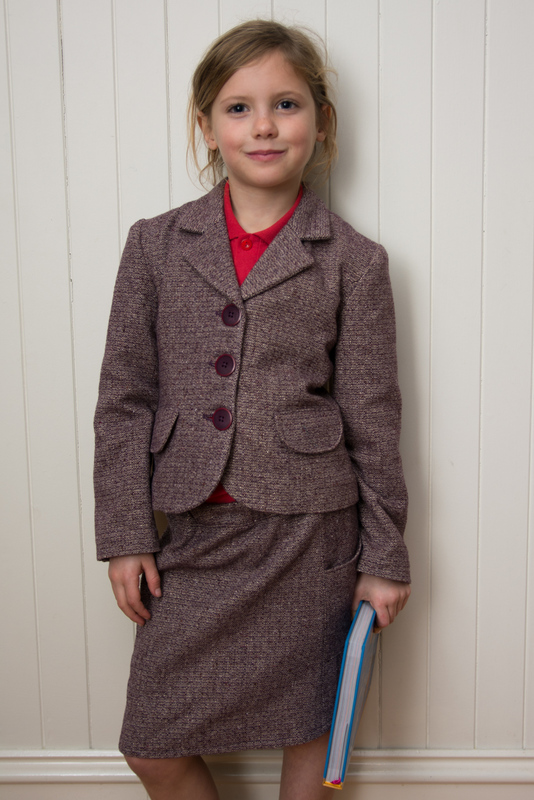 A little friend was having her birthday soon, and as she was about to turn 8 she had found a sudden fondness for a tiny size 18-24months blazer. Kids are hilarious like that, right? They flatly refuse to wear something until the sleeves only come to their elbows and their bellies are hanging out the bottom and then it's instantly their bestest, bestest piece of clothing. I'd never sewn a blazer before and it's the one pattern that so many of us have been waiting for Oliver + S to release the perfect pattern for (hint hint Liesl!). 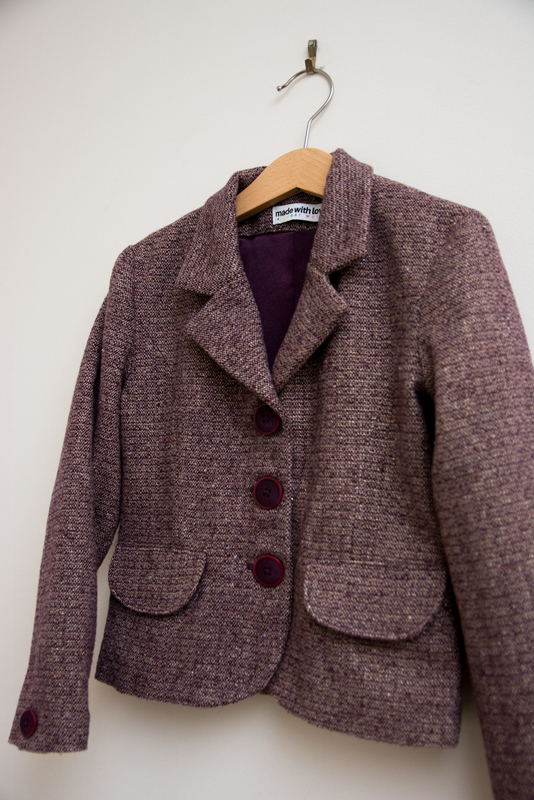 So, all I knew about sewing a blazer was that I didn't have a trusty pattern. But I knew I would have Liesl to talk me through it anyway, because I'd be using every trick I'd learned from all those other patterns to bring this one to fruition. Begin the pattern search! The closest match ended up being Burda 9724, an out of print pattern that I managed to find. It's sized from 7-12 years and I was nervous that the size 7 might still be a bit big. To settle my nerves (sarcasm font) I purchased the two sizes of this Vogue pattern thinking the bodice block from that might be the right fit and I could change the hem length and overly puffed sleeves. I need not have worried, as while my bigger, taller but younger kid measured exactly as per the size 7 measurements, the muslin I made was too small for her. It fit perfectly on the intended recipient and so I sent her mum off to shop for fabric. 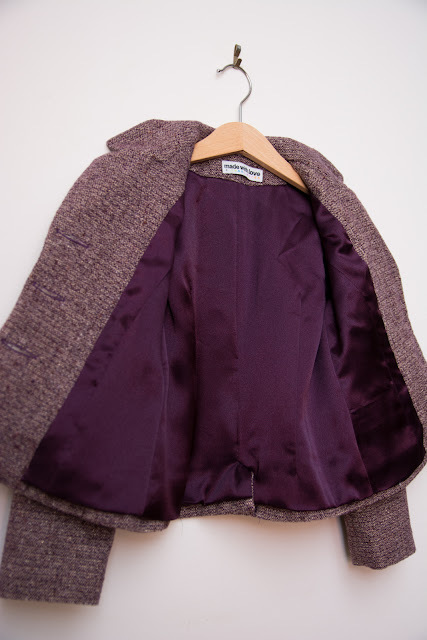 She was struggling to find what she wanted on our side of the city when I remembered she may not know about Eliza's, and there she found this eggplant purple, wool tweed that has a lovely metallic gold weave. - and the perfect matching satin lining. The only fit adjustment made to the pattern was to add 3cm of length at the hem. 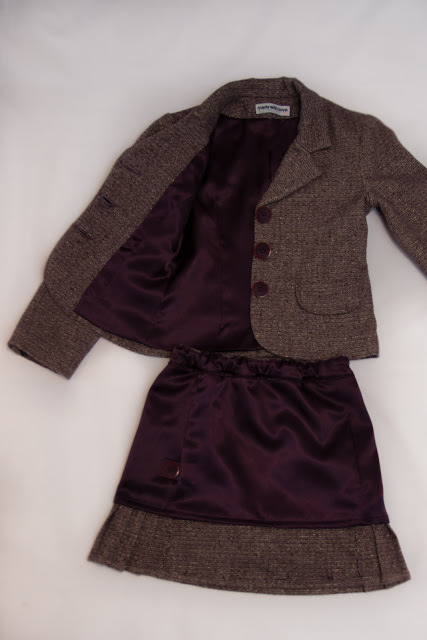 The rest of the fit was perfect, but it is quite a cropped jacket as illustrated on the pattern cover and it seemed that the un-hemmed length of the muslin was just right. Note to self: for my own daughter I would need to add considerable length mid torso as well as at the hem. The other changes were to make sure this jacket matched the original. 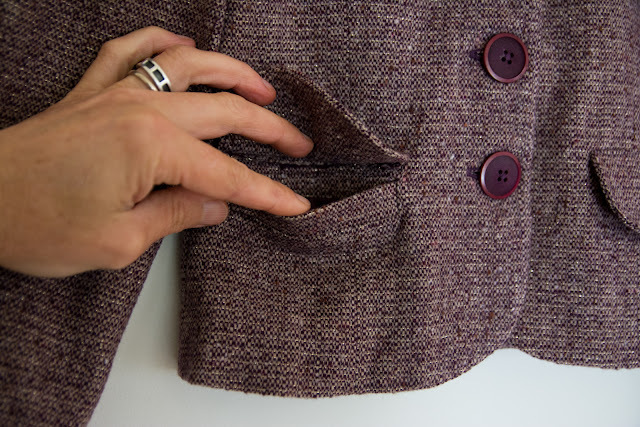 The Burda pattern has font pocket flaps, but no pockets. Easily fixed! The welt pockets from the Oliver + S Art Museum Vest (size 8 'cause it was already traced) fit perfectly under those flaps. The other change was to add a kick pleat at the back. Here I referenced a Vogue dress pattern that had a kick pleat, but I still managed to muff up the lining part. I'd invented my own depth and width of kick pleat and so I didn't really know how, or by how much, I should trim the lining. Add in that the lining had some vertical ease which would overhang the hem, and some pleats centre back for extra ease of movement, and trying to make my kick pleat lining neat was a struggle. It's OK but it's not really how it should be. 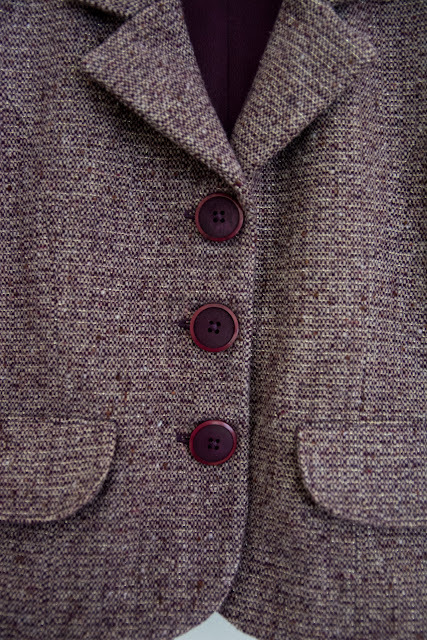 The penultimate pattern alteration was a faux opening at the sleeve. Here I used a similar kick pleat shape but then sewed the pleat closed - a bit like a faux fly on a pair of kid's trousers. That way the sleeve lining could just be straight and attach at the sleeve hem in a regular circular fashion. To make the jacket took barely 1m of fabric and my friend had over purchased by getting 1.5m - I guess at the Eliza price of $6/metre it was hardly going to break the bank to overbuy. Of course I couldn't resist making a quick skirt to turn the jacket into a suit! There's something quite hilarious about an 8 year old in a tweed suit. The obvious pattern choice was the Oliver + S Music Class Skirt. 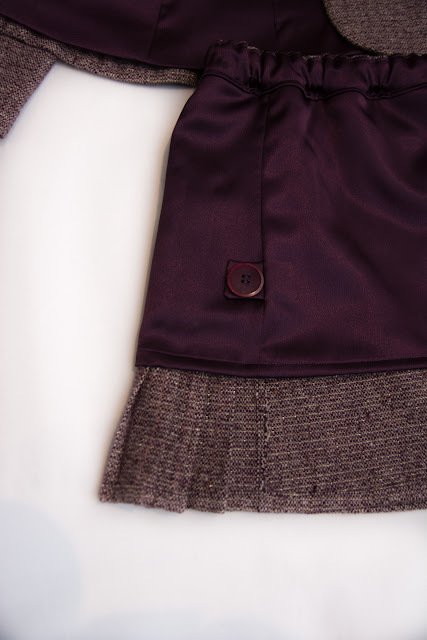 It's a gorgeous little straight skirt with these sweet kick pleats at the side. I knew the wool tweed was behaving very nicely when ironed and would co-operate just fine with the pleats. To prevent the skirt being too scratchy, I cut a lining. The lining was cut for the front and back skirt panels and the side panels, all shortened to just below where the pockets end and the pleats start. 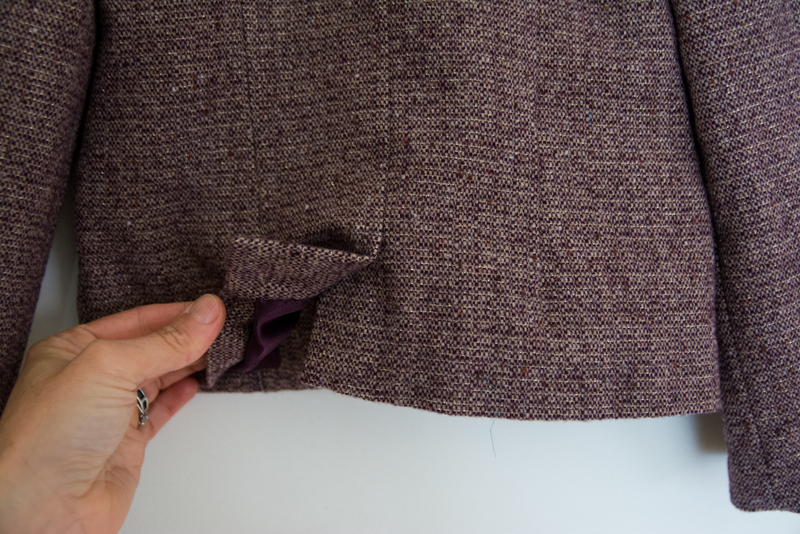 I also split the waistband so that the inner waistband was the lining rather than the wool. I also used one of my Kylie and the Machine labels that says: Made with Love and Swear Words. There weren't any swear words as it was a really enjoyable sewing experience but that's the kind of thing that was bound to amuse my little jacket wearing friend. We delivered it on the afternoon of her birthday and she put it straight on over her school polo and modelled it for me - the only payment I ever insist on being a few photographs! If you can track down the pattern I highly recommend it. The instructions are Burda brief, but it's very nicely drafted and is a lovely sew. 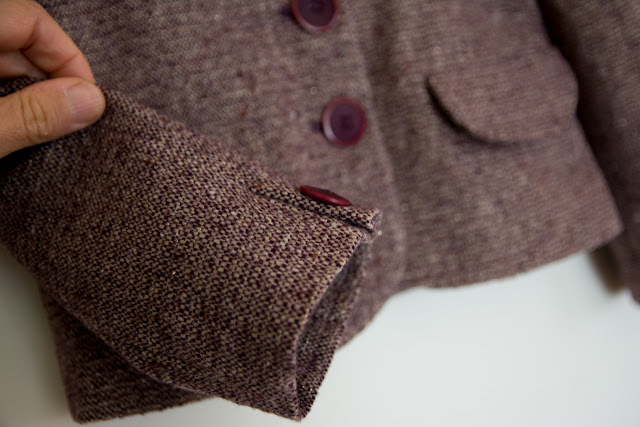 I'll be keen to make one for A soon as I think worn with jeans it will be a super cute and very useful little jacket. Skirt: added lining and split waistband to give lining finish against the skin. Fabric: Metallic tweed from Eliza, fabric content is always a mystery but it behaved and smelled like wool when pressed. Satin lining. Great job and so professionally done! You've done such a great job. The young lady is modelling it so well. It suits her so well. She looks quite the professional. Congratulations. Wow - this is SO impressive! You are a good friend...and clearly a pro when it comes to jackets and lining. 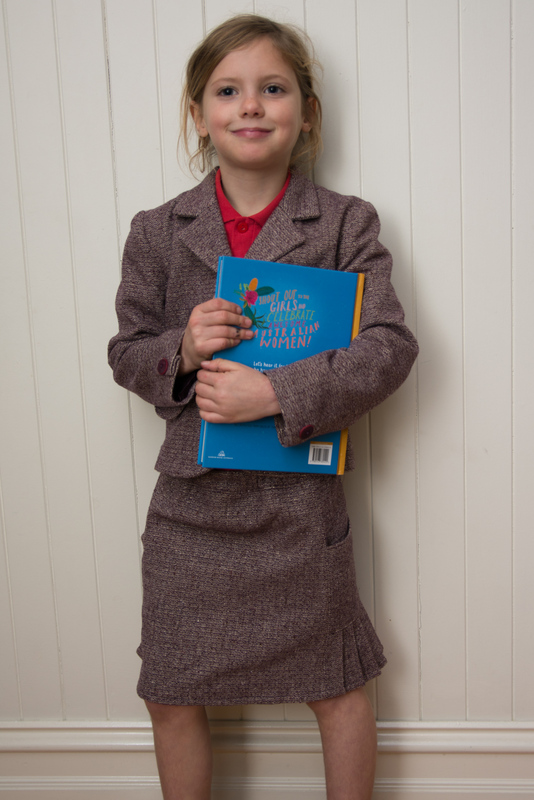 The birthday girl looks very cute in her 'grown up' suit! Wow! 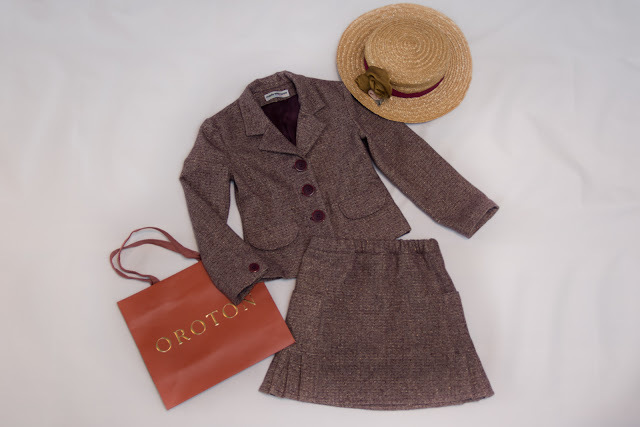 I love all the details in this amazing petite suit! You rocked it!